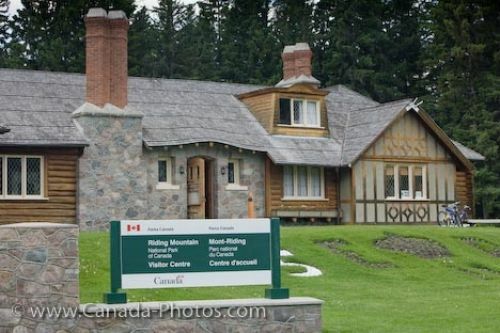 Riding Mountain National Park in Manitoba, Canada is protected by the Government of Canada as the sign outside the Visitor Information Centre displays. A heritage building which houses the Visitor Information Centre is set amongst the agricultural landscape and makes up part of the Manitoba Escarpment in the town of Wasagaming, Manitoba. The Visitor Information Centre offers a long list of activities which take place around the park as well as maps of the hiking trails and exhibits explaining Canada's heritage. Fishing licenses, vehicle passes and interpretative programs around the park can also be purchased inside the heritage building. The Visitor Information Centre is the central focal point of Riding Mountain National Park and should be the first stop while visiting Wasagaming. The town of Wasagaming becomes fairly busy during the summer months as it borders Clear Lake where many come to camp and enjoy their vacation. Picture of the Visitor Information Centre located in a heritage building in Wasagaming in Riding Mountain National Park. Visitor Information Centre, a Heritage building in the town of Wasagaming, Riding Mountain National Park, Manitoba, Canada.